Recently in Individuals and Societies (I&S) class, we have been working on food labels that show some of the problems we have in the world. Some of the examples are child labour, wasteful packaging, pesticides, fair trade and etc… My group members were Kenryo, Airi and Reina. We had to choose 2 problems but because, we have 4 people in our group, we chose wasteful packaging, child labour and obesity. I think most of the things went well in our group and the progress we made. For example, the investigation, we worked on it equally and did lots of research about infographics and other labels. I mostly worked on researching about wasteful packaging. I found out that wasteful packaging is a huge problem in the world that can cause more pollution and global warming. 75.2m tons of total solid waste generated in the US in 2012. In the past 3 decades ⅓ of the Earth’s natural resources were wiped out because of factories that causes lots of deforestation. We also mine and use too many limited resources, such as clean water, coals, and oil. Therefore we need to use less amount of plastic and other materials. 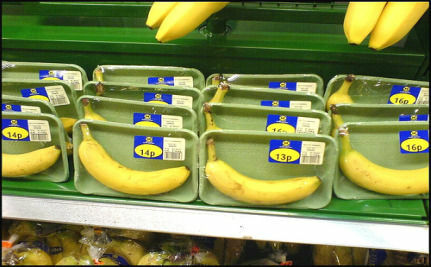 We need to have less food packaging. About 80% of what Americans throw away is recyclable, yet the recycling rate is just 33%. For example our group thought that this banana is packaged each when it doesn’t have to be packaged because, you are going to eat it anyway and take the package off so why bother to package it? So we used this photo in our investigation as a example of wasteful packaging. I think the biggest and hardest problem of this project for me was creating the labels on Photoshop. Because, I have almost never used Photoshop before and I didn’t even know how to use it. To solve this problem, I started searching and watching some tutorials of how to use Photoshop on the internet. But some tutorial wasn’t easy to understand then, I remembered that I have lots of people around me that are really good at Photoshop and also in my group all the people are used to use Photoshop so I asked some of my group mates to teach me how to use Photoshop. After I started getting used to Photoshop and practiced a little, I started planning my label and started creating my label on Photoshop with some help from my group mates. So here is the label I made in Photoshop about wasteful packaging. I tried to make it obvious that my label shows that the food or object with my label uses wasteful packaging and the percentages of the materials used to package and what kind of materials were wasted by packaging this food or object. The collaboration with our group went really well because, even though we were a group of 4, we got the equal amount of work for both investigating and creating the label. I think we mostly used time effectively during class time for the investigation part. Even though I only made one label, I and my group mates gave lots of ideas to each other so every label has everyones ideas in them. For example, for my label I couldn’t think of a idea to put below the percentage of what kind of materials that food or something uses. So I asked Reina and Airi for what I could add to my label. Then they gave me the idea of putting a human with a broken heart so it shows that wasteful packaging is not a good thing. If I were to do this project again, I think I would create one more label for the opposite of what I made this time (We don’t use wasteful packaging label) because, I really wanted to make another label because, it was fun thinking of ideas and creating it with your own hands using Photoshop. It was really fun working with my group and making labels and I think its a great project after having the exams because, it was a creative project that you can work with your group mates. What are Isabelle’s plans for tomorrow? In the morning she will go to her dance class and in the afternoon she will go shopping and at night she’s free. 2. What day and time of day is it? Its Friday in the afternoon. 3. Can you name three places where Mathieu suggests they go? A concert, the Zoo and a museum. 4. Can you name three things that Isabelle prefers to do? The Eiffel tower tour, a boat trip and going to the Sacred Heart (Sacré-Cœur). 5. What do they finally agree to do? What problem remains? They agree on going to a cinema. But they can’t agree on what movie to watch. Isabelle aime aller au zoo. 2. Isabelle a un cours de danse. 3. Mathieu aime la musique de Patrick Bruel. 4. Isabelle aime bien les musées. 5. Isabelle veut voir un film d’horreur dimanche après-midi. Isabelle refuse d’aller au concert. Mathieu propose d’aller au zoo. Isabelle propose d’aller au palais de Chaillot. Mathieu ne veut pas faire de promenade. Isabelle propose d’aller au Sacré-Cœur. Isabelle accepte d’aller au cinéma. Tu veux aller au concert de Patrick Bruel? d. Désolée, mais je n’ai pas envie. 2. Tu veux aller au Louvre? c. Désolée, mais je n’aime pas trop les musées. 3. Tu veux aller au zoo? a. Désolée, mais je déteste les zoos. 4. Tu veux aller voir Dracula? b. Désolée, mais je préfère aller voir un film comique. I would choose to go to the Zoo, the Louvre Museum. I think I would refuse to all of the other suggestions.